November 20, 2016 April 15, 2017 by Venky. BBCH Nandi Epic 2016 – An Epic Written In Pain! He was in pain but he was in his element on the climb. He was slightly behind the leader but was ahead of 80 others. It was eerily calm except for his own heavy breath. Then he heard something. Snap. His bike’s rear derailleur broke, breaking his rhythm and brought him to a standstill. He furiously tried to see if he can set it right and quickly realized he could do nothing. With 2 more km to go, he threw the shoes off and began to run up the hill with the bike. One by one, three of the riders who were behind him went past as he continued to run up in desperation to finish the race. With one kilometer more to go to the finish line, a rider coming down the hill offered his bike to him. He thanked god and the godsend rider and got on the bike. He began riding in his socks. He was back in his element again. Ahead, he saw a rider who went past him as he was running with his bike. He caught him and passed him just before the last bend. He battled through pain, on a borrowed bike, riding in his socks and crossed the line. Elated, dejected and totally spent! Just another epic performance in an epic race! Parshuram Chenji crossing the finish line on a borrowed bike in his socks! In 2008, a bunch of friends got together on a Sunday morning on the interior roads outside of Bangalore to see who can go fastest on a particular stretch of road. They got a kick out of it and decided to get together every third Sunday of the month and a series of races called Bangalore Bicycling Championships(BBCH) is born. Most of the riders have started cycling in the mornings or the weekends to stay fit, while slogging through 40-60 hour desk jobs, in the IT capital of India. For them, these races gave a purpose that is beyond just staying fit and made their rides all the more interesting. The number of riders at these races kept increasing as the word spread through blogs and beautiful photos captured during these fun community events. With each passing month, along with the number of riders, the quality of their riding kept on improving. The volunteer driven races always followed a specific schedule that is set at the start of the each season so that riders could plan their training for these races. Riders from different parts of the country started participating and the prestige of the events kept growing with the quality of the field. The volunteers from probably the biggest cycling community in India executed these races immaculately and that only added to the charm of the race series. BBCH now is one of the premier racing platforms in the country and typically Nandi race is its last and most prestigious race every season. The Peloton before the U-turn on the highway! A sedate start on a foggy morning! Nandi hills, a 7.34km climb gaining about 400m of elevation is the only paved climb of any substance that is easily accessible to riders around Bangalore. Located around 60km from the center of the city, it makes for an ideal weekend long ride with a fix of climbing for most riders in Bangalore. The climb times tend to serve as a scale to decide the pecking order amongst riders in the community. When a 100km race is designed to finish at the top of Nandi, it automatically becomes everyone’s favorite race. They call it Nandi Epic 100! And it usually lives up to the hyped up name! 181 riders registered across categories for this year’s edition of the Nandi Epic at BBCH. Riders from Goa, Delhi, Mumbai, Hyderabad, Chandigarh and other places across the country made it to the start line of this prestigious event. This year’s race was moved to a Saturday to avoid the Sunday crowd on the hill that played havoc with last year’s race. The race starts on a National highway just after the Bangalore airport on the outskirts of the city. For Elite and Master’s categories, the 100km route goes 42kms down the highway where it takes a U-turn and stays another 37km on the highway. Then it takes the before getting off it and taking the approach road to the hill 21km from the finish. For Amateur and Women categories, the race route follows a similar pattern but with the U-turn being at 22km making it a 60km race. The BBCH gets police permissions for their events but has to conduct them on open roads as blocking the roads for the little known sport of cycling isn’t going to happen anytime soon. But with lead vehicles, volunteers managing traffic and support vehicles following the riders, it is as pro as it can get for India right now. Anantha taking his turn at the front! The Elite and Masters riders were flagged off at 7am. It was an unusually cold and foggy morning. The peloton settled into a quick pace sans any major fireworks. Vinayank Goankar from Goa, Anantha Vishwanath from team Cleated Warriors, Shankar Jayaraman of team Spectrum Racing were the early pace setters. The first hour went relatively smoothly with about 40km covered and with the major players even taking a nature break and getting back to the bunch with the help of their lieutenants before the U-turn. Kiran Kumar Raju(KKR) of Trek( an MTB National champion in ITT), Parashuram Chenji(Parshu) of Hyderabad Racing League(a silver medalist in U-23 National championship road race this year), Sarvesh Sangarya of team Ministri racing, Naveen Raj of Wheelsports(Karnataka state ITT champion), Muralidharan(Murali), Vinayak are all good climbers and major contenders for the Elite podium. Craig Raynes of team BOTS, Arvind Bhateja of Spectrum Racing, Vivek Radhakrishnan, Nigel Smith of team Scott, Richard Mueller from Goa are all strong riders and contenders for the Master’s podium. KKR had alliances in Naveen Raj, Anantha and Nikhil Rammohan of team Crankmiester. Sarvesh had an alliance in Vinayak along with a strong team in Ministri’s Phanibhushan Mahapatra and Vinesh Chawla working for him. Murali and Parshu were flying solo. Right after the U-turn at 42km mark, the fireworks began to go off. KKR put his men Naveen and Nikhil to take hard turns at the front on the long uphill section right after the U-turn. That infusion of the mad pace quickly shattered the peloton into pieces. Naveen, KKR, Sarvesh, Parshu, Vinayak, Murali, Phanibhushan, Vishwesh Sangarya, Craig and Arvind made a star studded breakaway of 10 riders. Only Craig and Arvind of Master’s category made it to the break. A second group formed with Nigel, Richard, Vivek, Hari Menon(Spectrum Racing), Mohan Kumar(Spectrum Racing) who are all in Master’s category along with a few young guys like Mani Singh(Hyderabad), Vinesh, etc. Nikhil who was instrumental in making the breakaway happen couldn’t stick to it and landed in the chase group. Vishwesh also joined Nikhil in the chase group after pulling for a bit in the breakaway and dropping off. The power house Craig drove the pace hard in the breakaway. He would take strong pulls right after Arvind swung off from his turn at the front. In the process he was not only putting time on all the other master’s contenders that didn’t make the break but also putting Arvind through a lot of hurt. With Phani, Naveen and Vinayak taking regular pulls, the gap to the chase group kept ballooning up and reached almost 4 mins with 25kms to go. Phani cramped up and dropped off the race. Right around that time, KKR, Sarvesh and Parshu launched another attack and only Craig and Vinayak were able to follow. Naveen and Murali got distanced as did Arvind. As the lead group hit the right hand turn to Nandi approach road, getting off the highway, Parshu hit the turn a little too fast and slid on the slightly sandy turn. He left a bit of skin on the road but that didn’t faze him as he quickly got back on the bike and started riding. The others slowed down a little to let him get back on, showing excellent sportsmanship that BBCH stands for. On the Nandi approach road, even Vinayak got dropped paying the price for all the work he did earlier in the race before the U-turn and then in the break. He joined Naveen and Murali. Naveen was driving the pace again and was trying to bridge up with Murali and Vinayak on his wheel. Earlier in the race, he almost single handedly got KKR to the Peloton after his nature break, then set the pace at the front, made the break happen after the U-turn with some monstrous pulls at the front and kept at it for most of the time in the break. Even after so much work, after he got distanced at 75km mark, he didn’t sit back but kept time trialing away with Murali on his wheel. Watching his unbelievable capacity for pain was awe inspiring. Craig, KKR, Sarvesh and Parshu were the only guys in the break now and it seemed to have settled the top 3 of elite podium and the top step of the Master’s. Behind, Arvind was riding alone in no man’s land with the pace picking up in the chase group. At one point he had 3mins advantage on the chase group but that quickly shrunk to less than a minute as they approached the base of the hill. He was struggling and chances of him staying away from the chase group to take second in master’s kept diminishing. His own teammates, Hari and Mohan, unknowingly contributing the pace of the chase group didn’t help his cause. The front four hit the climb and it exploded once again. KKR, who hardly took the wind until he lost Naveen Raj, took off like the wind as soon as he hit the climb. He disappeared around the first bend up the hill with Parshu a little behind him followed by Sarvesh. Craig had no illusions of his chances on the hill against these featherweight climbers. He played to his strengths driving the pace on the flats where he distanced all the other master’s contenders and built a buffer of more than 5 mins for himself. He had a strategy and he executed it to perfection. It was now only a matter of making it up the climb and the top step of the Master’s podium. The fight for the elite podium, however, was very much on. With 3km to go on the climb, KKR had a huge lead. Parshu was behind him with Sarvesh well behind him. Behind them Naveen Raj and Murali were making good progress. KKR was in his zone. His journey started on the same hill 5 years ago where he raced on a borrowed bike in sneakers to finish 5thoverall. He kept chipping away at this race moving up the ladder finishing 4ththe next year, until he finished 2nd last year. This year, he was determined to finally crack this prestigious race and he had roped in all his friends towards that goal. They had delivered him to the base. It was now up to him to deliver. He was keenly aware of all the work Naveen Raj and others put in to get him there and he was paying their services proper homage in his suffering. He charged up the hill taking the inside line on even the steepest of the hairpin bends. KKR with his beast mode on! Charging up the hairpin bends! Parshu was around 500meters behind him with 3kms to go. He managed to put in a big gap on Sarvesh and others. He was in pain but he was in his element on the climb. He was slightly behind the leader but was ahead of 80 others. It was eerily calm except for his own heavy breathing. Then he heard something. Snap. His bike’s rear derailleur broke, breaking his rhythm and brought him to a standstill. He furiously tried to see if he can set it right and quickly realized he could do nothing. With 2 more km to go, he threw the shoes off and began to run up the hill with the bike. One by one Murali, Naveen and Sarvesh went past him as he continued to run up in desperation to finish the race. With one kilometer more to go to the finish line, a rider(Gaurav Bhatla) coming down the hill offered his bike to him. He thanked god and the godsend rider and got on the bike. He began riding in his socks. He was back in his element again. Ahead, he saw Sarvesh who went past him as he was running with his bike. He caught him and passed him just before the last bend. He battled through pain, on a borrowed bike, riding in his socks and crossed the line. Elated, dejected and totally spent! He finished 4th overall. Just another performance in an epic race! 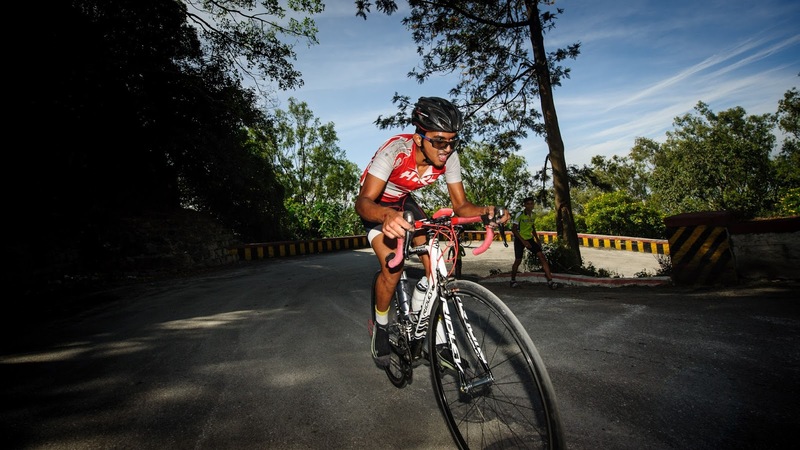 Murali, who managed to hang on to Naveen’s wheel after they got dropped from the breakaway and stayed with him until halfway up the climb, went past him on the steepest part of the hill with 2km to go. He finished a couple of minutes behind KKR in second. Naveen Raj despite all the work he was doing all day, finished 3rd just a few seconds behind Murali. Sarvesh finished 5th just behind Parshu. Parshu was unlucky. His crash at Nandi turn-off cost him more than a bit of skin. It cost him his second spot as it resulted in the rear derailleur breaking at a crucial moment in the race. But his indomitable spirit won him a lot more than a spot on the podium. Elite Podium! Naveen Raj(3rd), Kiran Kumar Raju(1st), Muralidharan(2nd) from left to right! In Master’s Category, Craig finished comfortably ahead of all the competitors. Arvind paid for all the matches he burnt in staying in the breakaway in the form of severe cramps as soon as he hit the climb. All the advantage he had before the climb fritted away as Nigel and Richard went past him and finished in 2nd and 3rdspots in Master’s category respectively. Hari and Mohan paid for the efforts of driving the pace on the highway. They ended up bringing their rivals fresh to climb and had them walking right over them. They finished 4th and 5threspectively. Master’s podium: Richard(3rd), Craig(1st), Nigel(2nd) from left to right! In the 60km Amateur Category, Tarun Rao of Ministri racing won comfortably with Veloscope rider finishing 2nd. Vinod Pillai of team Madrascals finished 3rd. Amateur podium: Vinod Pillai(3rd), Tarun Rao(1st) and Siddarth Krishnan(2nd) in that order! In the women’s category, Lena Robra of Team Crankmiester finished first with Aarthi Srinath of Team Madrascals at 2ndand Nitya Srinivasan at 3rd. Women’s category winner, Lena Robra with her podium loot! In U-18 category, Hyderabad boys Raj Kumar and Tanishq of Maxwell Trevor Cycling Acadamy finished 2nd and 3rd respectively with G.T. Gagan Reddy taking the win! Under 18 podium! Tanishq(3rd),Gagan Reddy(1st), Raj Kumar(2nd)from left to right! Thanks to all the volunteers and the core committee of BBCH, for another exceptionally executed race and season. Thanks to all the sponsors that back BBCH and the cycling community of Bangalore! Khuram K, Promise, Marghoob and Suman Paul: The core committee at BBCH! Previous The Spectrum Of Attacks, Strategies and Team Work!! BBCH – 100km Road Race May 2016! Super write up as usual Venky. Brilliant writeup as always and feels great to experience a little of the excitement in words!